"An activity involving physical exertion and skill in which an individual or team competes against another or others." It's odd. I don't support a football, rugby or tennis team but I like it when games feel like sports. Strategy + dexterity + teamwork = my ideal game. My current game of choice, Tribes: Ascend , nails all three. It think it's why I find Starcraft II so draining: 40 per cent of my brain attempts to recall build orders while 50 per cent of it attempts to implement them. The remaining 10 per cent of my powers are dedicated to countering my opposition's tactics and/or coordinating with my team. Then I panic and have a brainsplosion. Tribes: Ascend makes me feel just as satisfied but without the brainspolosion. Over the past few weeks I've established my role as a Technician and dedicated time to getting good at it. Yes, sometimes I feel like an overpowered caretaker compared glory hunting Pathfinder, but they don't get to casually chat with Tim as we lure dudes into a web of turrets, motion detectors and force fields. Whoops! I just remembered that it's Valentine's Day, and that my intro isn't the least bit romantic. 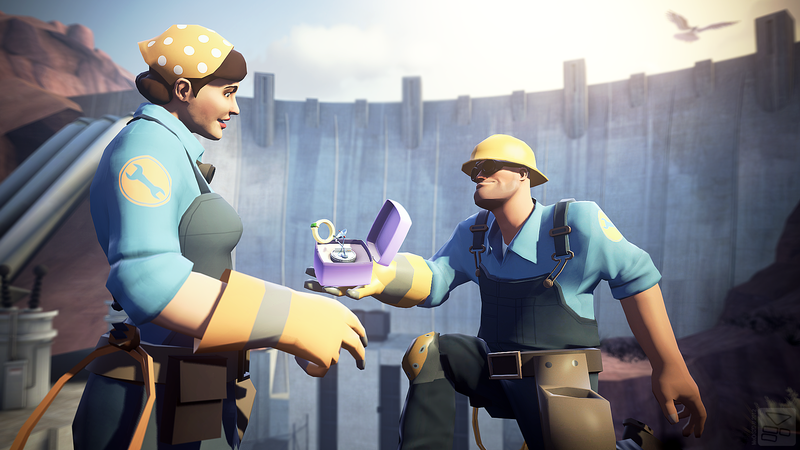 Here's some TF2 sweetness to compensate. Click through for more PC gaming news. Mojang says Minecraft clones are too " boring " to sue over. L.A. Noire might get a sequel. Ooo. Do you dream of being on EVE's Council of Stellar Management ? Now's your chance. Some footage of the latest expansion for Sins of a Solar Empire has landed. Here's an interview with one of the new writers at Bioware . Expect more GTAV news in a " few months ." AND NO SOONER, OK? Our friends at Nintendo Gamer launched their new website today. If you're fond of waggling a Wiimote in your spare time, check them out.